A few weeks ago we looked at the implications for higher education from the Giving USA data. This week we will focus in on the health sector and look at the implications of this latest giving data for healthcare philanthropy. The good news for health organizations is that the $29.81 billion dollars given to such causes in 2015 is the highest total that subsector has ever received in current dollars – slightly surpassing the previous high water mark from 2014 of $29.43 billion. In comparison to other subsectors of recipient organizations, however, health organizations are struggling to capitalize on the recovering economy and expanded charitable giving. 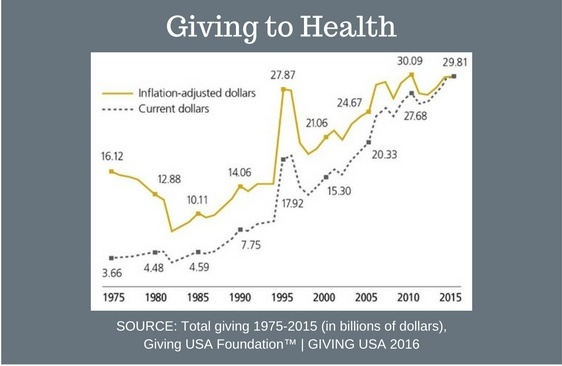 Since 2010, giving to health has grown 7.7 percent in current dollars, which pales in comparison to the 29.5 percent growth in total giving during the same period. Not surprisingly, giving to health ranked last in terms of growth out of the nine subsectors in that five-year span. This slow rate of change is due in large part to a steep 6.6 percent decline in giving to health in 2011 and modest recovery in the years since. Some, if not most, of this decline came as a result of donor uncertainty created by the passage, implementation, and legal challenges to the Affordable Care Act (ACA), which was approved in 2010 and will continue to be rolled out through 2022. The ACA has prompted reorganization of health funding models and healthcare delivery models across the country, and continued legal challenges and political promises to repeal and replace the law have left many in the field, as well as donors, uncertain of where the best opportunities for long term impact exist. At the same time, health research organizations have struggled with stagnant government funding from the National Institutes of Health (NIH) and other medical research related governmental funding streams. This has put pressure on philanthropic dollars to fund future innovation. Invest in your major gifts program. While health organizations have not been the primary beneficiaries, research suggests that much of the growth in giving in 2015 was due to increased giving by high net worth donors. Increased individual giving was responsible for two-thirds (67 percent) of the overall growth in giving for the year. Studies suggest that much of that growth was fueled by the expanded giving of the wealthiest individual donors. As recently as 2013, as study of high net worth donors found that health causes are among the four most frequent recipients of gifts from high net worth households. Strong major gift programs can build on this inclination to give to health and use more personal contact to build the trust and understanding to overcome donor uncertainty about the health landscape. Create compelling messaging about strategic priorities. The overarching public narrative about health in recent years has been one of upheaval and confusion. The degree to which your organization can present simple, compelling, and linear solutions to donors to counter that confusion will determine how likely it is that any level of donor will invest in your organization. Involve and educate physicians as partners in grateful patient fundraising. New research in 2015 revealed that although past research has established that doctors can be productive partners in identifying and cultivating potential grateful patient donors, they lack the knowledge of how to help and are generally uncomfortable with how such activities overlap with patient privacy responsibilities. Previously published research showed that coaching physicians in small groups about the practice of fundraising and how it interacts with patient privacy laws has increased both the identification of potential donors and the realization of gifts from them. Rethink event-focused fundraising. The largest “a-thon” style fundraising events around the country, reported an average decline in revenues of 2.6 percent in 2015. The vast majority of these fundraisers funded health causes (Komen Race for the Cure, American Cancer Society Relay for Life, American Heart Association Heart Walk, etc.). The biggest and highest earning events have been experiencing the largest declines, while less complex more grassroots oriented campaigns incorporating concepts like crowdfunding saw increased revenues. While large-scale, activity-based events are likely to continue raising significant funds in the near term, it may be time to explore more peer-to-peer events that capitalize more on social media.